There could have been a lot of reasons for Blaze Bayley to pack it in and call it a career. Although no fault of his own, his stint with metal legends Iron Maiden didn�t exactly work out as he would have liked. His post-Maiden outfit Blaze released three very good metal albums that went relatively unnoticed or ignored. The band Blaze had several issues in its later years and eventually broke up; and his deal with SPV went south leaving him without a record deal. Luckily for us, Bayley had the perseverance and dedication to complete and release �The Man Who Would Not Die,� easily his best work to date. The formula on this disc isn�t much different than what Blaze has used in the past - traditional metal with a distinct British flavor, combined with clever lyrics and Bayley�s strong, commanding vocals. That being said, this is far from a simple reworking of previous material. The overall sound is meatier and the compositions a bit stronger. There is also more of a variety of songs for the listener to explore. For the Maiden fans that have supported him there is �Samurai,� which opens with a Steve Harris-like bass line supplied by Dave Bermudez and has a Powerslave feel to some of Nick Bermudez and Jay Walsh�s guitarwork. �While You Were Gone� has to be one of the heaviest sappy love songs of all time, while �A Crack In The System� is a great anti-establishment anthem. �Robot� might be his heaviest and fastest tune to date and the melancholy �At The End Of The Day� is a nice change of pace. Songs like �Blackmailer� and �Smile Back At Death� really showcase Blaze�s vocal ability and lung power; and the title track might be the coolest of them all. Every once in a great while all music lovers find an album that they just connect with. For me, the latest such release is �The Man Who Would Not Die.� I could go on and on raving about this CD. But the bottom line is that Blaze Bayley�s latest is clearly one of the best classic metal releases of the year, if not of the decade. If you�re fan enough to be reading this review, you need to check out this disc. It is awesome. Every once in a great while all music lovers find an album that they just connect with. 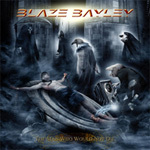 For me, the latest such release is �The Man Who Would Not Die.� The bottom line is that Blaze Bayley�s latest is clearly one of the best classic metal releases of the year, if not of the decade.